The porcupine is a medium-sized rodent, that is related to mice, rats and beavers. An adult porcupine is about 50 cm long (20 inches), not counting the tail. They can weigh from 4.5 to 13 kg (10 to 28 pounds). Long black and brown guard hairs and quills cover its body. The sharp stiff quills are actually modified hairs. 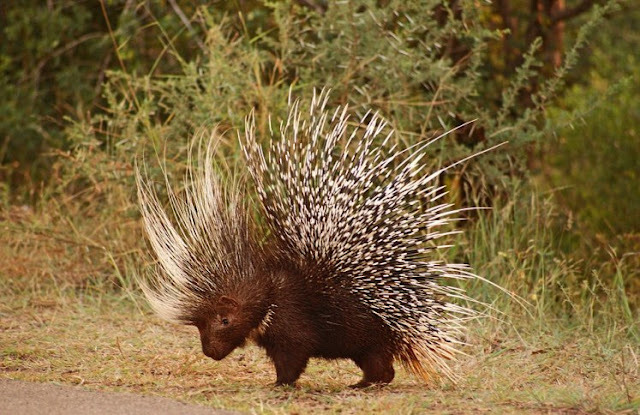 Body of the porcupine is covered with sharp spines or quills. Porcupines can NOT throw their quills. Porcupines live throughout most of the western United States and parts of the Northeast. They are also found throughout forests in Canada. Some porcupines have up to 30,000 quills on their body. It needs trees or shrubs large enough to provide bark and cambrium for winter feeding. Porcupines can't shoot out their quills, but they will be easily released when predators get it touch with animal. Porcupines like munching on a variety of trees including fir, hemlock, and pine, as well as maple, beech, birch, oak, elm, cherry and willow. They also eat several kinds of woody shrubs. Lost quills are replaced with new quills. When not in trees, porcupines prefer the protection of a den. The dens can be found in rock crevices, caves, hollow logs, or under houses and barns. Porcupines are nocturnal animals. This means that they sleep during the day and become active in the evening. They use their strong feet and curved claws to climb the tree. They are excellent climbers. Porcupine's home is called a den. They are herbivorous animals (eat only plants). They like to eat leaves, stem, bark, fruit. The fisher is the most formidable predator of the porcupine. Great horned owls, coyotes, bobcats, cougars, and wolves also prey on porcupines. They can live solitary life (left on their own) or in the small groups of up to 6 members. Porcupine vision is poor, but they have an excellent sense of smell. During mating season, female initiates close contact with male. The porcupine has thousands of quills on its back to provide protection from predators. Couple usually gets 2 babies and both parents take care of their babies. Babies are called porcupettes and they are born with soft quills. Soft quills will harden in the next few hours. Young porcupine will leave its parents after couple of months and begin solitary life. Native Americans used porcupine's quills to decorate themselves in the past. They also used porcupines as a source of food. Porcupines can live 15-18 years.